When thinking about the Montessori home school model, many parents don't know where to start. In this interview with Sharon Caldwell from the Montessori Foundation and IMC Representative: Africa, she lays out a better picture of what a Montessori home school would look like. What is the Montessori method and how did it get started? There really isn't a "method" as such. The book title "Montessori Method" was given to Maria Montessori's first book by her American publishers. It is more a philosophy or understanding of how children develop and learn best, based on Dr. Montessori's observations and discoveries from the late 1800's to her death in the 1950's and confirmed by Montessori schools around the world to the present day. What is your experience with homeschooling? I didn't "homeschool" so much as run a very small Montessori school from my home. Generally "homeschooling" is defined as educating your own children in your own home - and that is not something that would be completely compatible with how Dr. Montessori saw her approach being applied. Hence the difference between Dr. Montessori's views and an application of a "method" and use of materials. I'll elaborate more later. It is not possible to apply Dr. Montessori's approach in it's totality in a situation where a parent is working with only her own children because a vital element would be missing - the interaction with other children. This is why I started a small Montessori home school (at our largest we had 40 children ranging in age from 2 1/2 to 15 years). In very many ways it was more closely aligned with homeschooling (or rather what is known as "unschooling") than with what you see in most Montessori Schools today. Can the Montessori method be used for homeschooling? As above. You can certainly use components of Montessori - the methodology of giving and lessons, and the materials - but they will not be used in the way envisaged and applied by Dr. Montessori. Children do not engage in as much spontaneous activity in a Montessori home school situation, there is more direct adult intervention than you will have in an authentic Montessori School, and the materials tend to be used more as didactic aids (to teach a concept the parent finds important) than as means of development based on the child's freely chosen activity. How is the Montessori method different than other methods of education? This is really hard to answer simply. So here goes. Firstly it is based on an understanding of child development and a vision of human potential rather than a "curriculum" of what adults have decided a child should know. The role of the adult is different - the adult's task is provide support rather than direct teaching, to prepare an environment and then leave the child free to explore and develop. When material is offered, it is to provide "keys" - just enough input to help the child move to the next level. We have a concept of indirect preparation - that seeds are planted that may only show themselves in outwardly observable learning much later - this makes the attainment of easily discernible outcomes somewhat contradictory to the approach. Thus a major component of "teacher" training is to learn to observe, and to be patient. Without this preparation, most parents are simply not able to step back and allow their children the time and space to do their own learning. What type of materials would a parent need to purchase if they were going to begin using the Montessori home school method in their home? Not possible to say - it depends on the age and developmental level of the child. You provide what the child needs. I would advise that parents wishing to homeschool following Dr. Montessori's principles hold back on the materials and follow the philosophy mostly. That would involve getting out into nature, doing lots of practical work around the home, engaging in conversation and exploring literature. The core of Montessori is in responding to the child's developmental needs, not accumulating material. What are the advantages and disadvantages (if any) of using the Montessori method? When applied properly, the Montessori approach supports the development of creative thinking, an entrepreneurial spirit, and a well-rounded emotionally and socially mature attitude to life. It also, as a side effect, often results in a higher level of academic achievement at high school or college level than conventional schooling. Does the Montessori home school method use tests or worksheets? No, not if one if following the philosophy, because these are instruments suited to mass instruction in a factory school setting. They serve the needs of bureaucracy and curriculum, not the needs of a developing human being. 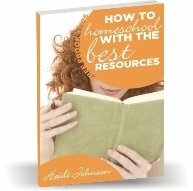 Do you have any advice for homeschoolers who want to use this method? Yes. Read up on the Montessori philosophy and do not pursue lesson plans until you fully understand the core principles. What you should know about your child by Maria Montessori is a good place to start. Thank you so much Sharon for being willing to do this interview on how a Montessori home school program could be implemented. I have homeschooled for many years and tried to set up a Montessori home school program even though I had never read Dr. Montessori's book. Now I realize that I probably should have done that first. I have learned quite a few things just by reading your answers to my questions. Thank you!